This section discusses health and safety issues relating to environmental factors in offices, including lighting, noise and air quality. Good lighting in workplaces is essential to enable people to see clearly and perform their work safely. tasks or activities performed, how often and for how long these are performed. In general, good lighting should enable people to easily view their work and environment without the need to strain their eyes. However, different activities require different levels and qualities of light. The visual demands of the activity or task performed determine the lighting needs of an area. Activities that do not require a high level of visual acuity – for example, walking through a corridor – do not require high levels or an optimum quality of light. On the other hand, tasks such as drawing or checking a document for errors involve fine and detailed work requiring a moderate to high level of visual control, and so greater levels and a higher quality of light are required. We are able to see quite well in a wide range of lighting levels due to the ability of the eye to adapt to different lighting conditions. For example, when you move from a bright room into a relatively dark area, or vice versa, your eyes adapt and over time (some seconds) you are able to see more clearly. To reduce the demands on your eyes and the need to adapt when changing tasks or viewing fields, or when moving from one work area to another, specific levels of lighting for particular types of tasks are recommended (see Table 4.1). The amount of light in an area can be measured using a light meter (or lux meter). This measures the amount of light falling onto a surface, which is known as the illuminance of that surface. Illuminance is measured in lux. Recommended illuminance levels for different types of work areas are approximate and are shown in the accompanying table. maintenance of the lighting system. All these factors need to be taken into account when designing lighting for office environments. A lighting designer should be consulted for designing lighting in a new office area. reduce the general lighting to suit the task being performed. Light reflected from a surface can make it difficult to see what is on it. For example, it can be difficult to read a screen when light from artificial lighting or windows is reflected from it. To identify reflections, observe a work surface or screen and ask the operator if they have difficulty seeing their work due to reflections. Don’t forget, light from windows changes during the day and with the seasons. 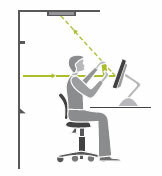 To assess reflections, hold a sheet of paper above a screen or place a mirror over the work surface to reveal the source of the reflections visible from the usual working position (see Figure 4.2). 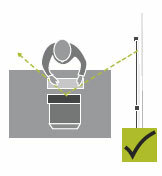 Check whether the mirror indicates overhead lighting or other sources of light as a problem for that work surface. Reflections from screens have been reduced by the development of colour monitors, Windows-based systems, Liquid Crystal Display (LCD) screens and non-reflective screen surfaces. Additional controls for reflections include positioning the screen sideon to the main light source (Fig 4.3). A light screen background also reduces difficulties caused by reflections. If these options do not resolve the problem, then consider moving the workstation to another position. This is particularly relevant where the screen is used for prolonged periods of time. These controls should be used in preference to the use of screen filters, which can reduce the quality of the screen display and require regular cleaning. Annoying reflections can also occur in workplaces where there are highly polished floors or glass covered wall paintings. These issues should be addressed when planning and setting up an office. Even glossy paper documents can reflect light and become unreadable. 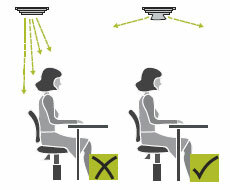 Shadows can reduce the visibility of work, contribute to glare problems and cause the adoption of poor posture in order to view work (see Figure 4.4). A simple observation and test by holding a piece of paper above the viewing surface can indicate whether shadows fall over that work surface. Assessing the effect of shadows may be achieved by observing a person’s posture. If a person is adopting a poor posture to read or see their work, then shadows may be a significant problem (also consider glare and reflections). Increasing the number and spread of overhead lighting, repositioning work or redirecting lighting are the main ways of reducing shadows. Barriers to light falling on the work surface – for example, an overhead shelf – should be removed or relocated to reduce shadows. An adjustable task lamp may provide specific lighting where shadows are a problem, where light from a particular direction is required or when an increase in general lighting is not practicable. A task lamp can, however, create pools of light, causing the eyes to have to adapt rapidly when looking at the whole work surface, so the removal of barriers to light falling on the work surface is the preferred control measure. When people find it difficult to see what they are working with, it is common for them to lean closer to the object or to bring it (e.g. a document) closer to their eyes. In both cases, this may lead to an awkward posture. Is a shadow being cast over the work surface? Is there enough light for the task being performed? Are reflections or glare causing the person to adopt an unsatisfactory posture? Eye muscles can become tired when constantly focused on close work. To identify if this is an issue in your office, ask people if they get tired eyes or other eye strain symptoms. To control visual fatigue, a change of focus, such as a view out of a window or to a picture along a hallway at a distance from the operator, can provide exercise to other muscles of the eyes while resting the tired muscles. When identifying, assessing or controlling lighting issues in offices, you need to take into account the time of day and year, as this will affect the quantity and quality of natural light in a work area. This is particularly important when designing lighting systems. Some of the office lighting issues may be caused by natural light entering a work area. By providing staff with control and adjustment of natural light, for example, venetian or vertical blinds, many of these issues can be addressed. Choice of colours can determine the mood of an environment and the level of reflection from a surface. It is recommended that ceilings have high reflectance, (reflecting around 80% of the light) and are usually white or off white. Walls should have 50 – 75% reflectance (subdued cool colours) and a gloss or semi gloss finish. Floors should have low (less than 20%) reflectance and therefore should be darker and not glossy. The use of colourful posters or non-reflective paintings can relieve monotony and provide visual relief. Some lights can be a source of annoyance, particularly older fluorescent tubes which may flicker when malfunctioning. Regular maintenance will help control the effects of light flicker. For further information about lighting in office environments, see references in Appendix D.
Noise is usually defined as any disturbing sound. In practice it is referred to as ‘sound’ when pleasant, and ‘noise’ when annoying. 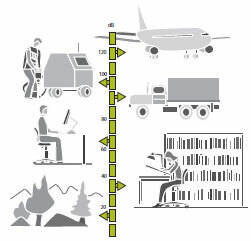 Typical noise levels in different work environments are depicted above (see Figure 4.5). Noise within the office can originate from internal and external sources. Internal noise sources include office equipment (e.g. telephones, printers and photocopiers), people (e.g. conversations) and background noise generated by the building (e.g. from lifts and air conditioning). Background noise generally goes unnoticed unless there is a malfunction of equipment. In fact, some background noise is desirable as an absolutely quiet environment can be uncomfortable. External noise sources can include road traffic and general industrial noise. Where noise has been identified as a hazard, such as in an industrial setting, the Occupational Health and Safety (Noise) Regulations 2004 should be followed to identify, assess and control excessive noise levels. The Guide for Assessing and Fixing Noise Problems at Work (2005) gives assistance in complying with the Regulations. Why is the control of noise in an office important? Generally, the levels of noise in office areas are below those levels known to pose a risk to hearing. In offices, ‘annoyance’ noise is likely which may interfere with communication, annoy or distract people and affect a person’s performance of tasks like reading and writing. This can be costly for an organisation. Noise that prevents a person from understanding an instruction or warning signal may also be a risk to safety. For these reasons, it is important to consider what can be done to control unwanted noise in the office. Some privacy during conversations is required, particularly in open-plan offices. 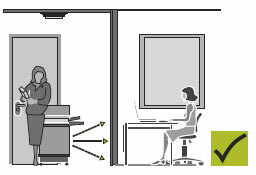 This requirement should be built in at the design stage of the office layout, when the distance between people and orientation of workstations is determined. People should be able to have telephone conversations and perform work without the person next to them listening to every word. Partitions are frequently installed to provide privacy between workstations. This involves considering the design of the whole environment including the size, construction and continuity of partitioning and all other surfaces in the office. Expert advice should be sought when designing partitioning to provide speech privacy. What noise is most disturbing (if any)? How do you deal with disturbing noise? This may be done using a general walk-through survey that includes interviewing people. Where noise issues have been identified as a problem in an office environment, assessment and development of noise control measures should be undertaken. A qualified person should be consulted where specialist assessment or advice is required. Noise control measures should be developed using the hierarchy of controls outlined in Section 1. The Guide for Assessing and Fixing Noise Problems at Work 2005 can assist with this process. orient workstations so that one person does not use the phone in a direct line to the ear of the person in the next workstation. Comfort is influenced by clothing, the job being undertaken, temperature, humidity and air flow. People may feel uncomfortable if the temperature within an office is either too low or too high. High humidity can create a stuffy, sticky atmosphere and contribute to feelings of tiredness. There are considerable individual differences between people regarding what is comfortable and it is unlikely that a single temperature or level of humidity will suit everybody. For further information on thermal comfort, refer to Comcare Australia’s Air Conditioning and Thermal Comfort in Australian Public Service Offices (1995). Do you find the atmosphere hot, cold, stuffy or draughty? When do you notice these conditions? What effect do these conditions have on your work? Where do you notice these conditions? Where thermal comfort is an issue, there will usually be a history of complaints from staff. Where problems are identified by many staff, thermal comfort issues should be assessed by an appropriately qualified person and control measures developed in consultation with employees. ensure adequate air flow. Feelings of stuffiness can result when air flow is low, and draughts occur when air flow is high. An air flow rate of between 0.1 and 0.2 metres per second is desirable. Air in offices may be contaminated by several different sources, including odours and micro-biological and chemical contaminants. In an office environment, the quality of the air is often controlled through an air conditioning system. A building’s air conditioning system can be considered its lungs. The function of such a system is to draw in outside air, filter, heat, cool or humidify it and circulate it around the building. The system expels a portion of the air to the outside environment and replaces this expelled portion with fresh or outside air. Guidelines on appropriate air quality standards for the office environment are contained in the relevant Australian Standards, particularly AS 1668.2: The Use of Ventilation and Air Conditioning in Buildings: Ventilation Design (2002). There are several air contaminants which can lead to health problems for workers in offices. Legionnaire’s disease is an infection caused by exposure to legionella bacteria. Infection can often be traced to exposure to mists of airborne droplets carrying the bacteria. These may be related to contaminated air conditioning cooling towers and warm water systems. Other sources may include aerosols from spa baths or potting mix. regular testing and maintenance of systems. Legislation includes the Building (Legionella) Act 2000 and the Health (Legionella) Regulations 2001, which are administered by the Department of Human Services. Comcare’s Approved Code of Practice on Indoor Air Quality (2002) contains guidance on prevention of legionnaires’ disease. Sick Building Syndrome (SBS) refers to a situation where a proportion of people complain of symptoms of discomfort such as a headache, eye, nose or throat irritation, fatigue, dizziness or nausea while inside a building and the symptoms go away upon leaving the building. Instances of SBS are rare and may be related to psychosocial factors in the workplace as well as poor air quality. Where air quality problems exist or SBS is thought to be a problem, specialist advice should be sought. Ozone is a gas produced in small amounts by electrostatic photocopiers. Under normal circumstances, the concentration of ozone is not sufficient to cause symptoms such as itchy eyes or illness. Most older photocopiers now have activated carbon filters fitted to decompose ozone. It is best to store photocopiers in a well-ventilated area. For more information regarding ozone, refer to WorkSafe Australia’s Office Copying Machines (1989).